In our quest to find the best burger in Scotland, we decided to stop at Brewdog in Glasgow’s West End after hearing so many people talk highly of the food. We had been in the bar several times before, although never for any food. We were attending a nearby MMA event at the Kelvin Hall Sports Arena and wanted to go somewhere nearby to grab a quick bite. Since Pamela already had her camera with her, burgers at Brewdog was an easy decision. The first thing I noticed about Brewdog’s food menu was how small it was. You can choose from roughly four different burgers or there’s also the option of their very tasty cheeseboards, if you are in the mood for something a little different. The fact that the menu is small is actually a positive. Brewdog is all about the beer, but what goes better with an ice cold beer than a tasty burger? Brewdog know this and have perfected the much-loved ‘beer and burger’ combination, loved by pretty much all Glaswegians. We both opted for the ‘Killa Morchilla’ burger, which consists of a delicious 6oz beef burger, topped with a generous serving of black pudding, sliced chorizo, blue cheese and salad. The burger comes served with salsa and a portion of tortilla chips. There was no option to add fries or any other sides, but that doesn’t matter – all of the focus here, is on the burger. The best value burger in Glasgow? As soon as the burger arrived, the first thing we noticed was how big it was. When we had looked at the menu, we noticed that the burgers were only £6 and despite having heard great things, we weren’t sure how good it could be at such a low price. I’ve seen people pay more for absolutely terrible burgers at half the size. Our concerns were quickly forgotten, as with one bite, we knew that we may well have found the best value burger in Glasgow. The bun was extremely high quality and tasted fresh.The combination of the black pudding and chorizo gave the burger a nice, spicy kick, which was complimented well by the mild blue cheese and the salad beneath the patty added a nice crunch to finish it all off. No visit to Brewdog is complete without an ice cold 77 lager. The meat itself was cooked perfectly – charred on the outside and medium on the inside and I can’t stress enough how good the bun was – it may even possibly be the tastiest burger bun I’ve ever had. A lot of people simply like basic, cheap, simple buns when it comes to burgers, although sometimes I do like something a little different. It tasted like it had just been made fresh that day in the kitchen and really set the burger apart from a lot of others that I’ve tasted recently. We didn’t add any of the salsa to the burger, but instead used it as a dip for the tortilla chips. These monstrous burgers were washed down with a delicious, ice cold pint of my favourite Brewdog – The ’77 Lager’. The Brewdog bar itself is very relaxed and the staff are always extremely friendly and knowledgeable. As with all Brewdog bars, there’s even a selection of classic boardgames for you and your friends to enjoy before or after your food, or whilst enjoying a few ice cold beers. Overall, a fantastic burger experience and a great way to kick off the new website. At only £6 a burger, you cannot go wrong. Forget your overpriced microwaved burgers from your typical McPub – if you are on a budget and are looking for something tasty, then Brewdog has everything you need. At just several minutes walk from Exhibition Centre train station and Kelvinhall subway station, there’s no excuse not to stop by. Have you tried this burger? Did you love it? If so, vote for it in the ‘Scotland’s best burger’ award by clicking here. 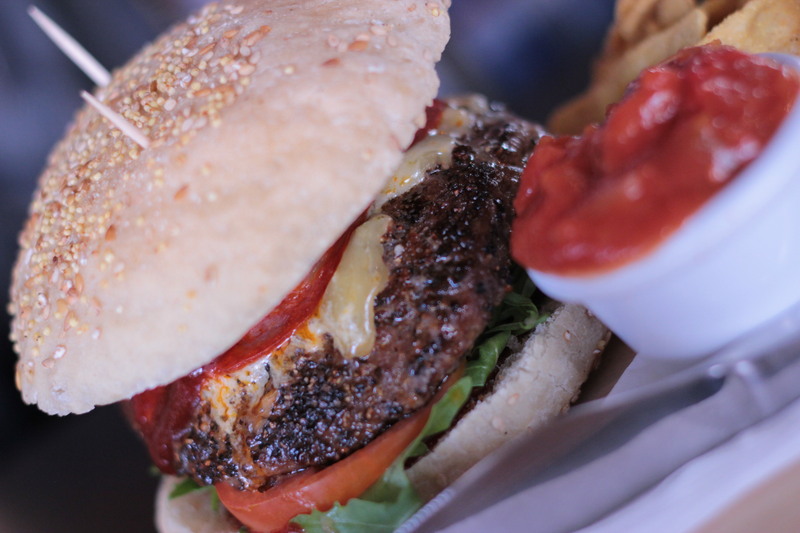 Talk to us on Twitter and tell us what you thought of this burger or leave a comment or review below. We want to hear from you! Use the map below to plan your visit to Brewdog Glasgow. PreviousWelcome to James vs. Burger!